Welcome to The 08th MS Team rewatch! The rewatch gets some good news and tries to get a party started but only manages to get ties up and tossed into an old cellar. Hey, can’t a guy just have good time without Zeon soldiers showing up to ruin everything? Why even bother trying? Where are all the Gundams when you need them? Eledore and Michel return from a mission before the rest of the 08th Team and they’ve been ordered to stay at the based until the others return. They’ve received mail and they open while chatting with Jidan, one of the mechanics on the base, who is eating his lunch. Eledore learns that a song he wrote is being recorded and will one day play on the radio. Jidan has his own good news to brag about, his delicious smelling lunch is the courtesy of a woman named Maria who lives in a nearby village. Jidan makes it sound as though he is romancing it with Maria. Too happy to pay attention to Jidan, Eledore wants to leave the base and go celebrate the good news even though he was ordered to stay on base. He convinces Michel to go with him. They leave the base on pretence that they’re going on a recon mission. Eledore say he plans on resigning soon, thinking he’ll make it big in the music industry. They arrive at a village but it looks deserted and the local bar is empty. They’re immediately accosted by Zeon soldiers who take them captive. The rest of the 08th Team arrives at base to discover their missing comrades. They soon learn in which direction they were headed and while Karen points out that their leaving the base is a violation of a direct order Shiro dismissed it, telling her the priority is to find his missing team members. Back at the village, the viewer is informed that the village is under strike Zeon control because the Apsalus crash landed nearby. They hope to have the ship fixed without alerting their presence to the Earth Federation. Eledore and Michel are brought to the basement cellar of a hotel where they are being interrogated. Eledore attempts to lie his way to freedom, pretending to want to become a double agent for Zeon. The interrogation is cut short and they’re locked in a cellar. A woman comes argues with the guard to let her in to see the prisoners and the guys overhear her name: Maria. She brings them food and kind, hopeful words. It’s clear to both of them why Jidan has a crush on her. Eledore is cracking under the pressure of knowing he’ll be executed come the morning. He can’t stand the cruelty of the universe that on the day he finds out his song will get recorded he’s captured and put up for execution. Michel, who seems to have swallowed up Maria’s hopeful words, tries to soothe Eledore’s sorrow. They get into a huge argument when Michel accuses him of being self-centered. Even he has stuff he wanted to do in life and he also has regrets, such as not being able to write a final letter of goodbye to his beloved B. B. The ruckus causes the Zeon guard to barge into the cell. The guys inadvertently knock out the soldier and upon realizing it, stop fighting an escape. The episode ends in a successful, albeit chaotic, escape and Eledore is severely wounded. He’s saved only by Karen’s medical attention. This is one of the top episodes of this short series. That is, as far as I can remember. I quite honestly haven’t watched the entire series in a few years. Whether later episodes are better than this one remains to be seen but one thing is clear, a lot happens in this episode and most of it proves to be important for our characters. The previous episode developed the character of Sanders (the former Reaper), this one focuses mostly on Eledore but Michel and essentially everybody else also get some nice character development. There is some action towards the end but mostly, the focus is on the members of the 08th Team who haven’t yet had their time in the spotlight. We learn a lot about Eledore. His enjoyment of music isn’t just a hobby; it’s something he’s trying to do for a living. The news that his song will be recorded is a big personal success. We also learn his dislike of the military and the war. He doesn’t want to be there but he doesn’t appear to have any other options other than breaking into the music industry. I wonder if he’s there because of a military draft or because he was unable to get any other type of employment. Either way, it sheds some light over his relaxed and somewhat detached relationship with his job. Based on what we’ve seen in previous episodes, he’s good at it but he doesn’t enjoy it. We also learn that he’s never piloted a mobile suit and the reason is a simple one, he’s claustrophobic. He can’t close the cockpit of the weapon he and Michel steal from the Zeeks. He’s far more comfortable driving the hover truck where he can see outside the vehicle. We also learn a fair bit of stuff from Michel and he proves to be rather naïve on several occasions. He’s also quite gullible, letting himself be easily manipulated to follow Eledore to the nearby village. The way he acts in this episode confirms what some astute viewers may have puzzled together from small character moments we’ve seen in previous episodes. One example of his gullibility is how quickly he bought into the Sanders the Reaper curse. In this episode, he foolishly belies that Eledore was trying to defect to Zeon and he nervously asks him about it when they’re locked up in the cellar only to have Eledore point out how silly it is for him to have thought that. 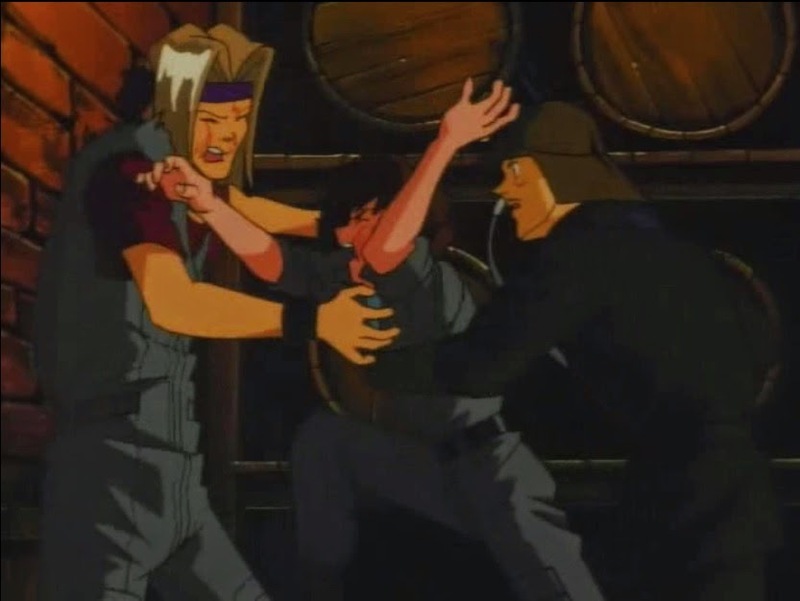 We also get to see how Michel reacts to being in a combat situation. 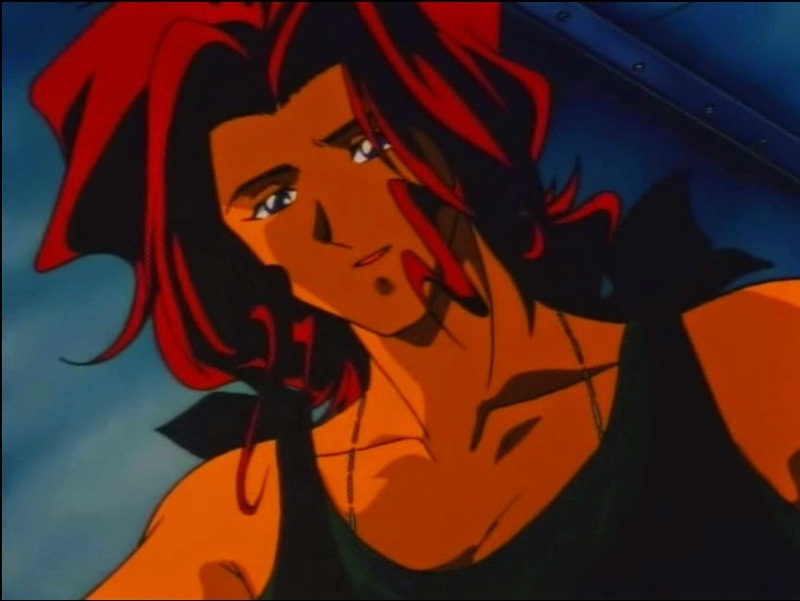 Up until now, he’s been in the hover truck providing support to the three mobile suits but he engages directly in combat during his escape from the village. The experience was shocking, mostly due to the severity of Eledore’s injuries, all of which he received right in front of Michel. His first combat experience was a very violent one and he’s likely not going to want to pilot a mobile suit any time soon. We learn in this episode that Karen has a gentler side. She administers first aid on Eledore and Jidan mentions that she’s learned her medical skills from her deceased husband. He was a medical doctor and died in combat. It’s a side we haven’t seen from Karen yet and it helps to round out her character because it lets the viewer know she’s not just a by-the-books soldier. At the very end of the episode she’s alone with Eledore in a tent while he’s in and out sleep. There is a caring look on her face. Eledore acted completely irresponsibly and she’s pointed this out to her commander but when her teammate is injured, she pushes that out of her head and focuses on the matter at hand. I quite like how Shiro handled Eledore and Michel’s adventure. He disciplined Michel. He was firm in his message but also pretty lax. He gives Michel a day off to recover from the ordeal because he obviously recognizes that Michel and Eledore went through a difficult time being imprisoned and having to escape. The entirety of the 08th Team went through a difficult time during “The Broken Order to Standby” but things aren’t going to get any easier for them. Next episode they have to deal with Eledore’s absence while he’s recovering from his injuries.